I spent at least three months reading this fat volume and about the same time answering questions from my friends as to why I was doing this. Why in hell am I reading the History of Modern China? Of course, the simple answer is that I compulsively read anything l lay my hands on but then I’m also on the mission the most knowledgeable person in the world, so that my arrogance is backed up with some erudition. Sadly, I’m no Mike Ross and I have retained at best 10% of the facts in this book. The second half of the book is filled almost entirely with accounts of purges and paranoia, so typical for any dictatorship. This is the history that has already repeated itself thousands of time and you would think that people would finally wise up to those methods. But no, they fall for it each and every time. 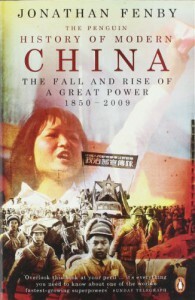 I must say that Fenby wrote a lot about the early Mao, the bullied loser. And it made him into an almost sympathetic character – this is not the effect I wanted the book to achieve. Sometimes I am just not interested in a three-dimensional portrait of the history biggest assholes. So what’s to happen with China now? Is it a colossus with feet of clay? Yes, probably. It is possibly true that China is not ready for a multi-party democracy. It wouldn’t fare any better than the so called ‘biggest democracy in the world’, India. But then how will it ever make itself ready if not true trial and error? (Luckily, at least China doesn’t have to worry about the US ‘bringing democracy’ to them).